DEUTSCHE GRAMMOPHON is going to bring the "Complete recordings Vol. 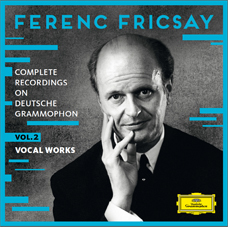 2 of Vocal Works" (Limited Edition) of Ferenc Fricsay in July 2015 . Leben" by Ferenc Fricsay and in addition 2 DVD's of his rehearsals: Dukas "Zauberlehrling"
"Complete recordings Vol. I of Ferenc Fricsay " as download in the internet. 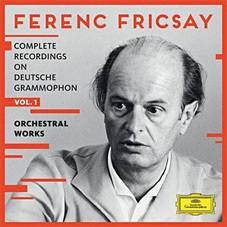 Commemorating the 100th birthday of Ferenc Fricsay – Audite offers 14 selected Fricsay - productions in 21 single CDs as anniversary bundle. Leitner · Jochum · Fricsay a.o.